Acoustic Action Part 1: How Low (Noise) Can You Go? In the computing world, our customers face an ever-growing challenge; faster running systems with higher power requirements. Increases in performance, power, and speed generate additional cooling needs that, in turn, present us with our own challenge; a high performance fan that’s acceptable for use in acoustic sensitive applications. At ebm-papst, we strive to rise to the occasion. Acoustical noise limits defined by the Telcordia NEBS standards are system level requirements and fundamentally, have not changed in some time. Customers are constantly pushing the limits of what can be done with an air mover – most commonly by increasing the speed of an existing fan technology. This solution ends up being a double-edged sword; although the cooling needs can now be met, the overall solution is significantly louder. Doubling the fans performance doubles the noise created by the fan. This can be a significant challenge when such stringent targets are currently in place, due to decade old standards. Luckily, at ebm-papst we invest significantly in R&D to create innovative technologies. 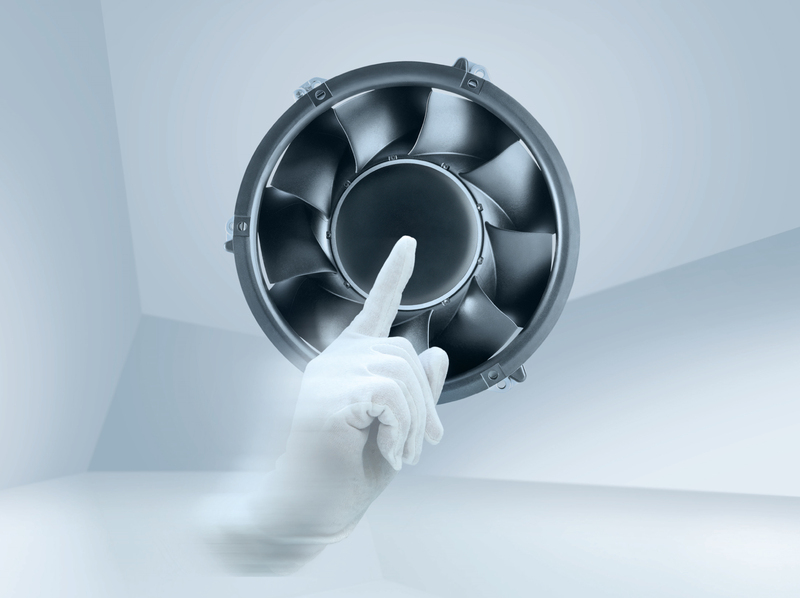 Part of our GreenTech philosophy is to always improve upon the previous generation of fan technology – whether that’s in the manufacturing process, the performance capability, increasing overall efficiency or reducing noise produced by our fans. Our teams of Research and Development Engineers work tirelessly to meet these goals. Our knowledgeable teams of aerodynamicists have decades of experience in the realm of acoustical reduction with many innovative technologies that we incorporate into the development of each and every fan. Some of the more common reasons for high acoustical noise in customer applications are systems with considerable resistance or many small fans running at very high speeds. Typically, these tubeaxial fans are very inefficient and must be run at fast speeds to achieve the necessary cooling performance. One of ebm-papst’s newer, more innovative products is our DV6300 series. This fan allows us to not only combat systems with high impedances, but it also incorporates some of our innovative technologies to help reduce fan noise. One of the ways we are able to design a more acoustically optimized fan design is through the use of noise optimized motor struts allowing us to reduce noise as much as 8 dB(A)! Another way we are able to help combat noise increase is by working closely with our customers on system-level developments. The combination of our team of experienced Applications Engineers along with our on-site airflow and semi-anechoic acoustics chambers, allow us to provide end-to-end services. Our test results and engineering expertise provide useful suggestions for changes to customers systems to help reduce acoustics at the system level. At the same time, we can also help improve efficiency within a customer’s assembly allowing us to further reduce fan performance (in turn reducing acoustics even more!). Have you experienced any of the above acoustical nightmares in your IT/Telecom application? If so, how did you resolve them? What solutions did you choose moving forward? We welcome your feedback in the comments box below.